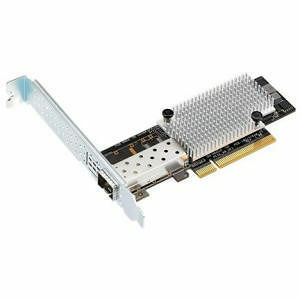 The ASUS PEB-10G/57811-1S adapter features a smaller 4.72"x 1.77" form factor. The 4.72"x 1.77" form factor is even smaller than standard low-profile MD2 form factor; thus allowing customers to integrate the adapter in space-limited systems easily and flexibly. PEB-10G/57811-1S provides a flexible and perfect fit for various server integrations. More and more applications require high-bandwidth to transfer large data, especially data center, HPC, web-hosting and enterprise uses. New 10 Gb/s Ethernet is an ideal technology for moving large amounts of data quickly, more than sufficient for the network needs of large scale virtual machines and virtualization environments. The bandwidth it provides in conjunction with server consolidation is highly advantageous for cloud computing, virtualization software, web caching, real time application response, databases, social networking and business logic apps, science simulations, and professional modeling.